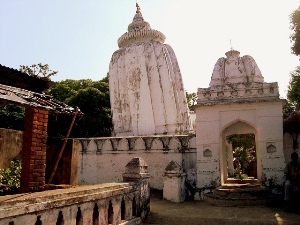 The Leaning Temple of Huma in India is the only leaning temple in the world.It is located in Huma, a village situated on the bank of the Mahanadi, 23 km south of Sambalpur in the Indian state of Odisha. The temple is dedicated to the Hindu god Shiva.Huma is a place of pilgrimage, and is also visited by strangers out of curosity to see the different kind of fish in the river. A great fair takes place at the foothill in March every year on the occasion of Sivratri. The presiding diety is Bimaleswar Siva.Now about the main point of attraction i.e. the tilted structure of temple. From the investigation and interviews performed by our team, nobody able to give satisfying reply. The surprising thing is, the main temple tilted to one direction and other small temples tilted to some other direction. The special type of fish found here are called as 'Kudo' fish. They are said to be so tame that they will eat sweets and other foods from the hands of those who bathe close to the temple. During auspicious days they are called by their names and given the 'prasad' of the God. Here nobody tries to catch them as they are believed to be the assets of the God.